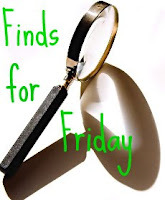 If you're looking for Friday Fiction, scroll down one post, or just click here. Hope you stop by and read these posts. Following the blogs would also be a good move, I think - always wonderful reads! Thanks for stopping by. Thanks for the recommendations, Joanne! Have a great weekend!